Jennifer Awes Freeman is a visiting assistant professor of historical theology at the University of St Thomas. She recently completed her doctoral work at Vanderbilt University; her dissertation, “Erasing God: Carolingians, Controversy, and the Ashburnham Pentateuch,” is a study of Trinitarian doctrine and images during the transition from Late Antiquity to the early Middle Ages. During the summer of 2016, she was a postdoctoral fellow at the Medieval Institute at the University of Notre Dame. ​These collections include: the Luther House in Wittenberg, the State Museum of Prehistory in Halle, the Luther Memorials Foundation in Saxony-Anholt, the German Historical Museum in Berlin, and the Foundation Schloss Friedenstein in Gotha. The exhibit, which drew a total of 110,966 visitors, ran from October 30, 2016 – January 15, 2017. (The anniversary of Martin Luther’s posting of his Ninety-Five Theses on the Power and Efficacy of Indulgences will be October 31, 2017). Art production is probably not the first thing that comes to mind regarding the Reformation; rather, the Protestant Reformation is better known for its iconoclasm and anti-image rhetoric (especially by figures such as Ulrich Zwingli and John Calvin). But even Martin Luther (1483-1546), who was comparatively moderate and was no iconoclast, ridiculed the superstitious treatment of religious images and openly mocked the proliferation of (apparently) fake relics. The Martin Luther exhibition at Mia traced the origins, development, and impact of Luther’s theology. While the subtitle was “Art and the Reformation,” the exhibition in fact contained a wide variety of artifacts, the majority of which could be more accurately described as images (or material culture) rather than as “art.” This is, in part, thanks to recent archaeological discoveries at the Luther House in Wittenberg, as well as to the nature of the Protestant relationship with (i.e., criticism of) church wealth. Accordingly, the presentation of the exhibition’s items reflected their diversity: paintings and altarpieces were displayed in the usual way—mounted on walls or atop pedestals, while archaeological artifacts (such as broken toys from Luther’s childhood home) were grouped in vitrines. Furniture was also used to reconstruct Luther’s environments, including his study and, most impressively, the last pulpit from which he preached. The exhibition was organized into eight themed rooms, sequenced in chronological order, which—especially for those unfamiliar with the history of the Protestant Reformation—created a natural and informative progression. In “Boyhood,” the museum goer encountered Luther’s formative context, which included illness (represented by a plague hood and brass embellishments from burnt clothing), his family’s wealth (evidenced in his father’s ledger), and Catholic piety (a statuette of the Virgin), among other things. The following room displayed the trappings of “Secular Power,” that is, the political dynamics that had a symbiotic (parasitic?) relationship with the church. Examples of note included the brass cover plate of the tomb of Count Hoyer VI, a woodcut of the electors’ coats of arms (with the papal coat of arms added), and Emperor Maximilian’s pilgrim’s garment. The next, “Pre-Reformation Piety,” captured the transition between late medieval and early Renaissance worship. Viewers could examine a representative Mass of St. Gregory altarpiece and compare relic inventories, rendered in print and drawing, with similar reliquaries. Also on display were several liturgical garments and the immense illuminated choir book of Naumburg Cathedral. In the fourth room of the exhibition, “Luther as Monk, Scholar, and Preacher,” the focus returned to Luther’s personal life, and the tipping point of the Reformation. Splitting the gallery in half, a partial wall presented a translation of the famed Ninety-Five Theses, below which several relevant printed texts were encased; appropriately situated in a vitrine before them were an indulgence chest and example of an indulgence. Walking around the room divider dramatically revealed the pulpit from St. Andrew’s Church in Eisleben. The room “Luther’s Theology” was dominated by the 157-panel Gotha altar on one wall. The altar’s combination of text and image in every panel is a testament to Protestant suspicion of images; here image is justified by the presence of lengthy quotes from the New Testament. The room also included more practical items, such as an example of a sermon timer. “Luther’s House as the Hub of the Reformation” was filled largely by the reconstruction of Luther’s studio; around its periphery were found painted and printed portraits of Luther and Katarina, as well as objects from their daily life, such as pottery and writing tools, as well as Katarina’s famed lost ring. In “Polemics and Conflicts” the tension rose again; the gallery was filled with images and objects of violence (such as weapons and broken images), hate (including Luther’s own anti-Jewish tracts), and ridicule (as seen in several satirical woodcuts). The exhibition concluded in a visually brighter room, titled “The Legend,” which was overwhelmed by the debate stand from the University of Wittenberg, but also included treasures such as memorial portraits. It is difficult to describe the number, quality, and diversity of objects of this exhibition. The weaknesses of the exhibition were few and paled in comparison to its overall success. These minor issues included the illegibility of display texts caused by the combination of low-lighting with the dark-colored background and text; one couldn’t walk through a single room without hearing a visitor comment on the reading difficulty. Relatedly, magnifying glasses or supplementary detailed photos would have been useful for examining numerous items more closely (such as the Islamic ornamental embroidery on Maximilian’s pilgrim’s garment). Lastly, it would have been interesting if the final room had incorporated a contemporary example of Luther’s legacy (aside from the relic-like piece of floorboard)—especially given the fact that the exhibition took place in one of the most Lutheran cities in the United States. 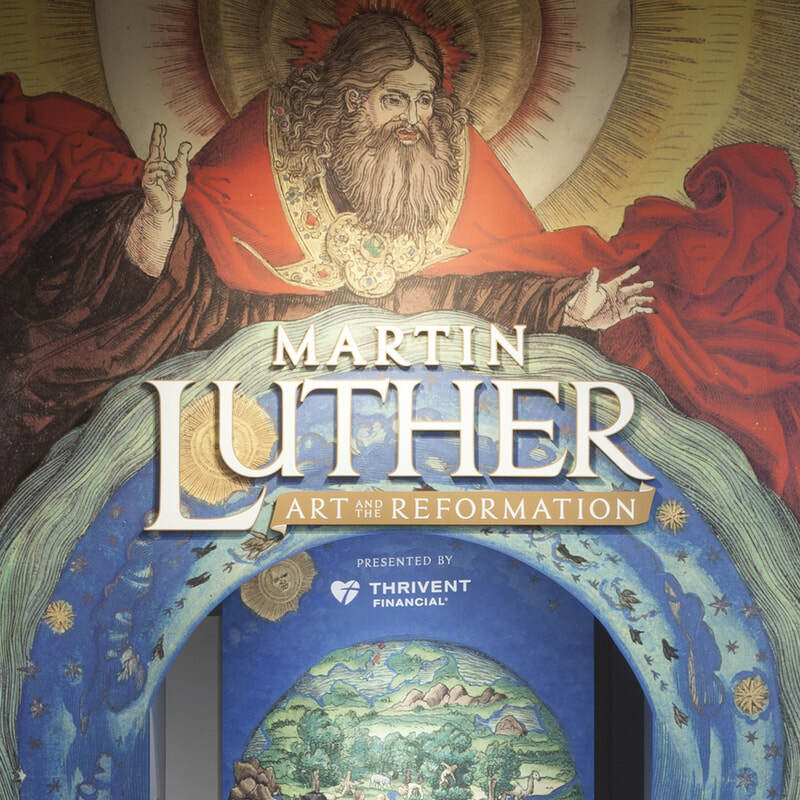 Martin Luther: Art and the Reformation at the Minneapolis Institute of Art offered a once-in-a-lifetime opportunity to be immersed in the material expressions of Luther’s reforming theology. One of the most valuable contributions of this exhibition was its extensive evidence that Protestant theology was not simply expressed in the written or printed word: it could also be found in sculpture, paintings, jewelry, and, yes, even a beer stein. Caption: Installation view of the exhibition “Martin Luther: Art and the Reformation”; 30 October 2016 - 15 January 2017. Organized in cooperation with the Minneapolis Institute of Art, Luther Memorials Foundation of Saxony-Anhalt, Wittenberg, Deutsches Historisches Museum, Berlin, and Foundation Schloss Friedenstein Gotha, under the Leadership of the State Museum of Prehistory, Halle (Saale). Mia Target Gallery; galleries 266-274. Photo: Minneapolis Institute of Art.